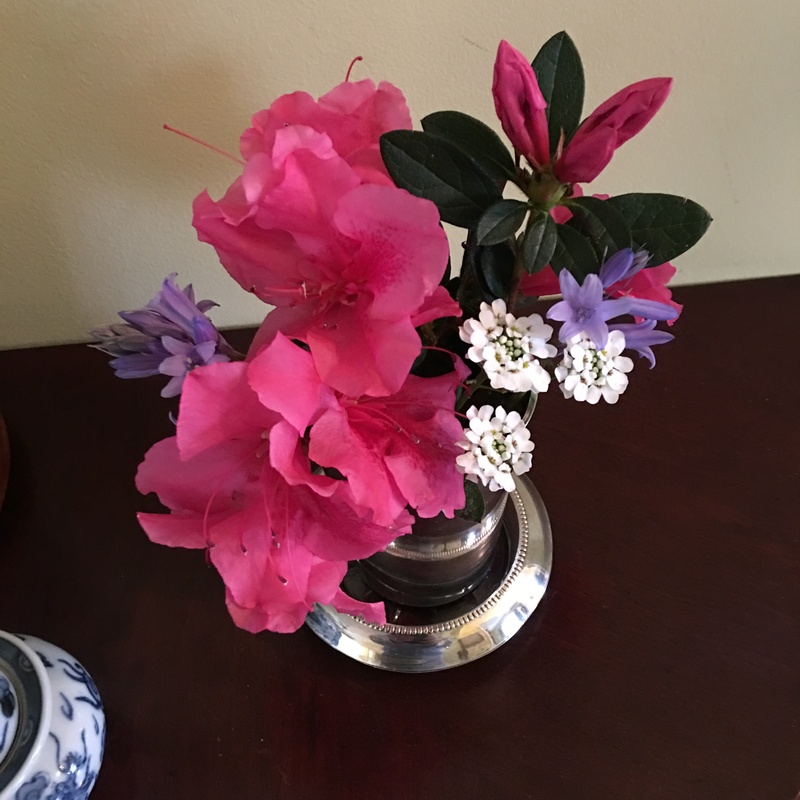 I am happy to share some of the first spring blossoms from our Encore azaleas and the sweet bluebells, both of which have opened in the past week. 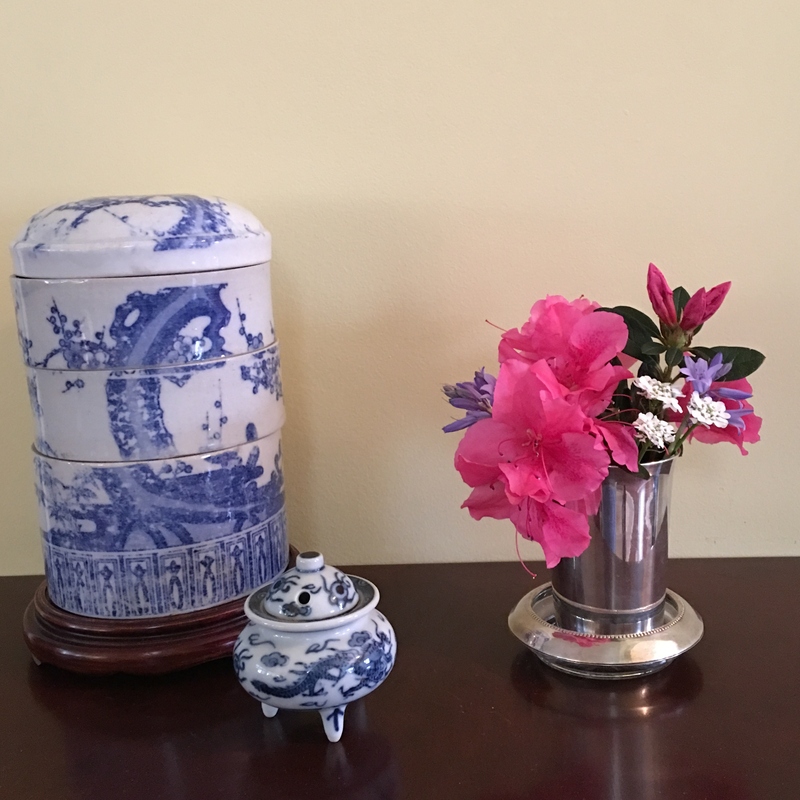 My Arranger selected the silver cup given to her at her baptism to hold this Monday’s flowers and placed it next to a Japanese obento and an incense container. A bit of candytuft was added for contrast. Please visit Cathy at Rambling in the Garden to see what she is sharing this week. This entry was posted in Gardening, In a Vase on Monday and tagged candytuft, Encore azalea, English bluebell, Rambling in the Garden. Bookmark the permalink. Your arranger, as always, has done a brilliant job! The azaleas remind me of time living in the Southeast – they were always so lovely. The additional blooms, ceramics and silver cup set them off beautifully! Beautifully done! Happy spring and happy Monday! Thanks, Peter. And Happy back at you. The silver cup sets these blooms off beautifully. Excuse my ignorance, but what was an obento used for? Obento is a Japanese picnic container. It is made of several stackable containers. Put rice in one, seaweed in another, fish in another, etc. Like so many Japanese everyday items, it is artistic and practical. Can’t beat azaleas for spring color. The special cup makes a nice container. Thank you, Susie. Special cup for a special lady. Thanks, Cathy. Glad you are feeling better. Luscious azaleas John – and I’ve learnt a little more about Japan today! Thank you, Cathy. It’s fun to learn a little each day. Love the Blue China, I am a Blue Willow connoisseur. Sweet Bluebells? Just bluebells. Not sure of which they are…I just love them. So enjoyed your sweet little arrangement for its colors and the fact that both of our arrangements this week have something in common, an incense burner. Bluebells are a particular favorite of mine, having grown up in England (now living in San Francisco). We used to gather bunches and bunches of them in the woods across the road from our house in Kent. Sweet memories! I’m glad that they brought back the memories. Memories of flowers are wonderful. Wow, those are some huge Azalea flowers. Thanks, Jason. They are starting to show everywhere now. Beautiful flowers! I love all the colours and how beautifully the flowers have been arranged. Also, I am definitely keeping a lookout for a similar vase; yours is splendid! In fact, I was totally inspired by you (and your dedication to posting these every Monday!) and decided to do a post of my own (even though I’m not a gardening blogger). I’d be honoured if you checked it out. Thanks! Thanks for your kind words. 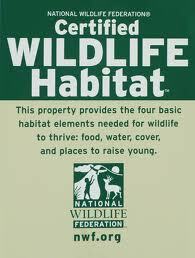 I have looked at your site and want to encourage you to continue. It’s fun. As always perfect flowers in beautiful combination. What a wonderful time of year. Thank you. It is a wonderful time. Colors everywhere. Thanks, Jo. Glad you liked it. Great photos, flowers, and arranging! I posted on some of the flowers blooming indoors at my house this week, too! Always nice to see the colors! Thank you. I enjoyed your photos also.